In a small saucepan, combine sugar, water, and mint leaves. Bring to a boil & allow to simmer for about 10 minutes; stirring occasionally. Remove from heat, and allow to cool for 15 minutes. Strain mint leaves out, and set simple syrup aside. Meanwhile in a large pitcher, combine orange juice, prosecco, and lemon & lime zests. Add berries, sliced lemon & limes and stir to incorporate. Lastly, add the simple syrup and give it one last good stir. Fill glasses with ice cubes and pour sangria immediately. 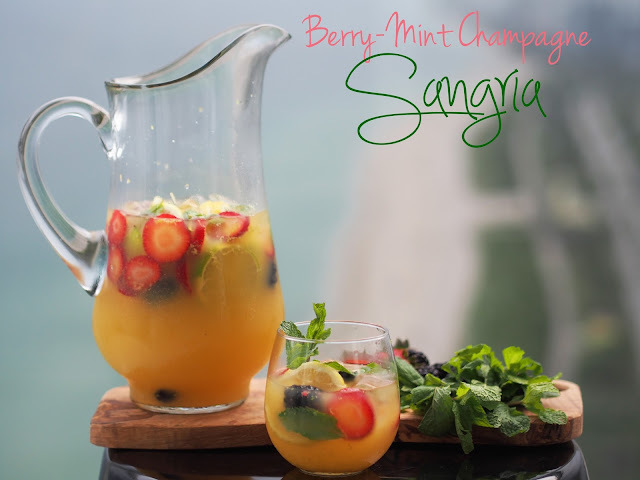 Garnish with fresh mint leaves and enjoy! Looks delicious, will def be trying this out on a hot day!